Destiny IS an MMO, no matter the phrasing that Bungie uses, but it's also critical to understand that it's a bit more than just an MMO, it's an online game with a massive community, and a lot of eyes on it. With such a huge groundswell of attention sitting directly on it, it's very hard to make commentary because the audience is so huge and the tastes are so big. Which to me, is a great thing, and attests to the games ability to stand on its own two feet and shows that Bungie can create new IPs without having to constantly revive Master Ch(i)ef to come cook up some new trouble. Bungie, of course, is known for its long line of successes and Destiny builds on it all, from Marathon and Myst to Halo, removing Oni from the picture of course. There is a little of something from each of the games and a lot of Halo in the mix (again, no Oni - the one off of a failed attempt at Bungie to expand studios is rarely mentioned) and overall, even if the game was to be terrible, there is still the issue of it already being a massive commercial success - reports that 3.2 million players are still actively engaged in the game. With statistics like that, you might not need a review to help you decide if this is or isn't your next gaming purchase, but I do think reading the opinion of a seasoned gamer could help tip the scales in one direction or the other. Destiny is beautiful, both in its gorgeous artwork and its fluid game design, it's like a fine plate of haute cuisine, there is this gorgeous spread of food in front of you, but there is that guilt that you're eating something so good but only in its pure simplicity and perfection of techniques handed down for ages, and I think Destiny easily can replicate that. There is nothing new or exciting here, there is nothing that is different or groundbreaking, but there is a game that is everything you could ever want and no more, because any more would ruin the perfect balance between a shooter and a multiplayer game. The world is filled with other players, actively moving about their business as you do yours, and the maps and missions are all engaging, although a bit repetitive. Destiny had my blood pumping more than any game I recently played as I struggled to deal with a variety of enemies all with their own unique AIs and random assortment of weaponry. It's one of the rare games that give you something you've already seen, but can make it one of the most engaging moments of your life, even though though you've been there and done that, the perfection of of the execution of all the various mechanics just leave such a sweet and satisfying taste in your mouth. While a negative, I consider it part of the positive, that the only negative things to bring up are characteristics belonging to the genre and the fact that any of the issues present are so minor that it resides within the playerbase's ability to exploit a cave for loot. I could go on garrulously all day about the beautiful and enticing things about Destiny, but I would be repeating the things said by nearly every reviewer: the gameplay is spot on, the graphics are beautiful, and Destiny scratches all of the shooter itches. One of the things I want to highlight is the PvP. 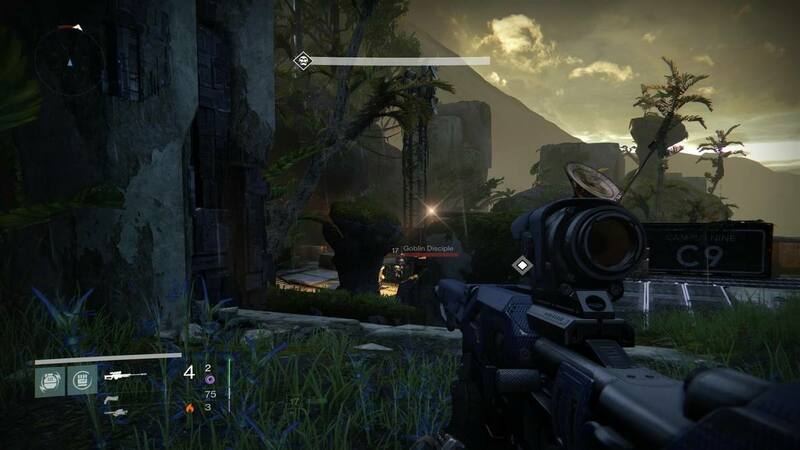 Destiny does a great job balancing the classes between PvE and PvP. Games like Battlefield have multiple classes, but they're all balanced around PvP, and the class only determines the loadout. Destiny does an amazing job balancing it all with each class having not only access to every weapon and armor piece, but also with its own unique special ability loadout. I'm sure there are rumblings somewhere that Warlocks are too powerful or that specific grenades are too powerful, but at the end of the day I have yet to run into a scenario that made me feel bad because of the game and not another player. Many of the various mechanics just feel really good to play, like item upgrading. It's just a very fluid process, gain XP then go to your item and choose the property you want to unlock. The same with the various class abilities. As you level, you get more unlocks, and you can pick and choose how to customize your character. There are options from very minor statistical changes to major redefine your entire class sub-class changing. Although there is a ton of options, they're all easy to understand and switch around, and do not have a major enough impact on your gameplay to ever make it feel out of place. The entire RPG element of the game is wonderfully executed and is one of the most pleasurable micro-RPG integration I've ever seen. The upgrades are really cool and the weapon customization is advanced enough to give it a bite but not too complicated to stress you out. Think of Diablo II but loot is condensed and simpler. Ultimately, I can sum up my entire positive experience with the game by highlighting the fact that I think that each and every element that brings the game together is nearly if not flawless, and the execution of the gameplay, the graphics, and the sound is one of the most pleasurable experiences I've had in a game. There isn't a story - the game doesn't have a point to drive you forward and this works and it doesn't work, depending on the type of player you are. A Dark Room for instance is a game which there isn't much of a story - you find out facts and tidbits, but nothing concrete ever shows up to say this is what's happening and this is what's going on. Sort of like World War Z the novel in which it's just a simple collection of stories, but as you read each story a bigger picture sort of makes itself out. For Destiny, the majority of the game is fighting some Halo-esq monsters which are on Earth for reasons relating to the Traveler, but there is no conclusion or primary goal that makes the world safe. Each of the planets is a self-contained micro-story, there is some small objective that you must obtain, usually in the form of slaying a boss of some kind and retriving something from it. The Earth is saved simply from the efforts of you going out and running quests and returning back to the Speaker. Which, isn't really a bad or good thing, because it works but it's not I think as involved as if it had a more fleshed out story. Bringing back the head of a major leader represents weakening of the forces attacking Earth and makes me ponder if this is for sequels or even to create a constant stream of DLC to entice players to pay to find out more. The world is empty a lot of the time. The Tower is great, there is tons of players always walking around, but on the various mission maps you're often running past players who don't have the same goals as you, and as a result you briefly see other players as you move to your mission, which when it's at the actual mission part, is solo only unless you bring your own team. This creates a feeling of dread and emptiness, which is alright, but not necessarily that great. Playing alone isn't nearly as fun as playing with friends and the maps and difficulty make so much more sense when there are team fighting with you. Additionally, in total there is only about 20 hours of content in the game. You could finish as fast as six hours, but the average is 12, with about 8 hours or so of additional content. However, that's just for the single player story, there is an infinite amount of replay in the multiplayer. The community is a hit or miss, I find it to be really enjoyable and a lot of awesome people in it, but there is a lot of general poison and negativity. Which is okay, in a game this big, it just happens and none of it feels like the frat boy meanness that was in Halo. The areas in which you can't respawn can get really stressful and death can be a "put the game down for awhile" scenario since you may have to reinvest a lot of time to redo that portion of the mission. While checkpoints are numerous, there are areas where you have to redo the entire portion of the mission in the restricted respawn areas. I almost want to put this as something negative, but it is part of the games charm to keep you on edge and truly punish you for dying - it's a big personal preference thing. Many players do not like the group finder for Strikes or the lack of a group finder for or way for the public to join missions and patrols. I did not see this as an issue, but I figure it is important to bring up. There are two major issues I have with a game that is otherwise a beautiful perfectly polished diamond. The first is the repetative missions and I'm not specifically sure if that's a personal negative mark or just an issue with the genre. Phantasy Star Online is a game that is played over and over again, along with Monster Hunter and that's one of the major features of the franchises, but the big issue with Destiny is that each mission is essentially the same mission, in a different location. In Gears of War you're always introduced to new and interesting game mechanics, but in Destiny there is only one: you're in a room with monsters and they're either up close or far away, and you must use the environment to fight the enemy. That's it, that's the entire gameplay. There are some enemies on vehicles, some interesting locations, but over all the only thing there is a few bosses and a lot of enemies that are the same enemies copied and pasted everywhere. Once you learn how to deal with them, it only becomes an issue of figuring out how to tackle the quantity versus figuring out how to advance. Retries aren't a learning experience, it's more of a Max Payne style run into a room and die to see where the enemies are, reload a quicksave, and then bullet time into a room where you know where the enemies are sort of thing. The difficulty is the opposite of what it should be, with the early game being the hardest and the endgame being the easiest. When you start out, you literally have nothing, and are fighting the same enemies you'll fight later in the game, but without any of the tools necessary to deal with them. The game isn't obnoxious about this and it helps support the idea of your character gaining power as you level up, but it's a very rough start. If you choose any of the maps out of order (which is easy enough to do), you can be stuck in an almost unwinnable scenario. I have nothing negative to say about the PvP - I just want to make that note because I feel like it's absent, but the PvP is so satisfactory to me that I don't have any complaints and just want to rationalize that so it doesn't feel as if I skipped over it. I do not count the loot cave or the Cryptarch as anything negative - I see them as a personal moral issue that everyone should reflect on once the information is given to them. Bungie sees the loot cave as an exploit and want players to obtain the same satisfaction but working through the available maps and has been slowly patching in more incentives to explore the world instead of sitting in front of a cave all evening. As far as the Cryptarch, he started off as a major issue, but has since been made a bit more reasonable. For those not in the know, the Cryparch is the Deckard Cain of Destiny and "identifies" or "decodes" gear of a specific rarity or higher, but at launch legendarys would more often than not decode into rares, which angered the community. Engrams now will decode into their corresponding rarity, so a legendary Engram (unidentified item) will convert to a legendary item, rare into rares, and so on. Destiny is fun and nearly a required purchase for any modern or semi-modern console owner. You won't do wrong purchasing it if you're a fan of shooters. You don't need friends to play, but if you do, it changes it from a "go out and buy it when you can" to a "get it right now." You're either going to love it or hate it and that is going to be directly pinned to if you love or hater shooters and if you're receptive of the most mainstream game to come out in recent history. I enjoyed Destiny throughly and put more than 52 hours in it, I would say way more if you include other local accounts and playing at someone else's house with their character. I believe that it definitely isn't a waste of cash and if you're thinking of it I would suggest go for it. No matter the result, odds are you won't be disappointed and the worst that could happen is you find yourself thinking the hype is too much, but I don't think there are many who walk away from the game with a sour taste in their mouths. I think Destiny deserves a 9, it doesn't bring anything too new or exciting to the table and if it had a little bit more Gears of War in it I would say the game in of itself was perfect, something to break up the repetition, but otherwise the game hits every nail on the head and I don't think it'd be a mistake for anyone to purchase.